Pavo. © 2003 Torsten Bronger. 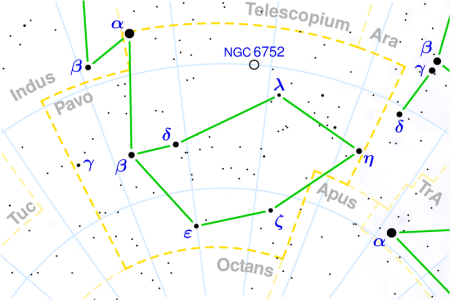 Pavo (abbreviation: Pav), the Peacock, is a southern constellation lying between Telescopium to the north and Octans to the south. Its most noteworthy deep-sky object is the globular cluster NGC 6752 (magnitude 5.4; diameter 20.4'; R.A. 19h 10.9m, Dec. -59° 59'), large enough to be well seen with binoculars or a small telescope. See below for details of the constellation's brightest stars.